We are a traveling family and I think as an expat it seems we travel more than most. We are blessed that we have friends in various countries and that both of mine and Mr P’s families are in different countries is a plus and minus. It seems we fly around the world with our kids a lot but we are always staying with friends and family every time which makes it easy and affordable for us. But every other year we like to take a big family vacation just the four of us. When we do our immediate family holidays I like to plan from my kids’ perspective. I look for things that are going to make them happy and excite them. After all, it’s about them when it comes to this type of traveling not what the entire extended family want or anyone else. Our last big family holiday was to Lanzarote and we planned it so well it went flawless, which is rare for us if you follow my travel posts. It still is one of the best holidays I have ever gone on. 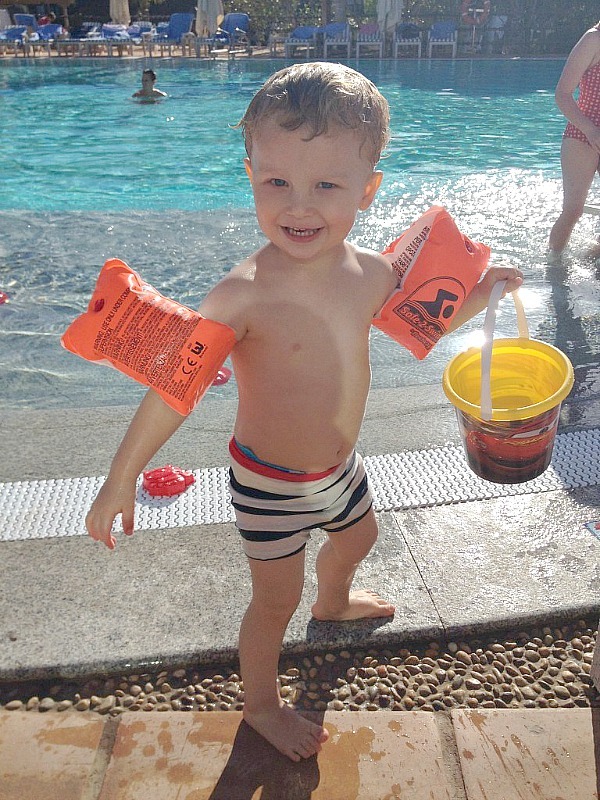 Here are 6 top tips to plan the very best kids’ holiday! 1. Pick a destination that is family / child friendly. That means food, drinks, weather, entertainment, pools all for kids. 2. Search online for package holidays because you will get more options and more reviews from actual families that have experienced it first hand, to help choose an accommodation. It’s also less stressful for you to book everything together. They can tell you what’s available for various kids’ ages at each location. 3. Plan fun days at the hotel or villa and plan fun days out and about. Kids need down time as much as adults when traveling. So don’t overwhelm them with a few full days out and about, back to back. Spread your big adventures out a little from each other. A tire child is not a fun holiday for anyone. 4. Look for kids clubs or soft play areas. A lot of hotels and villas now have these available for children. The kids love time away from their parents as much as parents do. Why not put them in kids club for a few hours in the morning grab yourself a spa session or a margarita by the pool. Whatever you prefer! 5. Check out the food options. Most children are picky its a known fact. If you have a children that’s less than willing to try new foods make sure wherever you are staying has a little market or has things on the restaurant or hotel menu that your child is willing to eat. Especially if you are traveling to an exotic place that doesn’t speak good english. 6. Think like a child. It wasn’t very long ago we were kids ourselves. What did you like to do at the age of your children? I always try to think in their shoes. What would wow them? Would it be seeing animals or water slides? Or both? Kids’ have great imaginations so use yours too. A day at the beach making their favorite disney character sandcastles is like disneyland to them. Make sure to pack those disney character sandcastle buckets for them. Preparation is the key here. I love our big family holidays because it’s quality time together, making memories with each other. I love my family and friend holidays too, of course I do. But there is something so very special about just the four of us too. I love that we can have a mixture of both types of holidays for our kids and show them the world and give them memories that will last forever. What do you look for when you are planning holidays around children? Do you prefer to stay local or go abroad for family holidays? Would love to read your comments. I am honored to have made it to the Brilliance in Blogging 2015 Shortlist for VIDEO! I would be so grateful if you could take a minute to vote for Let’s Talk Mommy. Thank you all for reading and your continual support. If you haven’t seen my videos check them out here. We are in a similar position, Jenny, with family and friends all over the place, but you’re right… There is something special about getting away… Just your little family unit. Really helpful post! Thanks hunny. There will be lots more tips coming as we prepare for our next trip it really is nice both kinds of vacations for sure. Different memories but all great ones. Oh yes it really does change it up. I will be blogging more about traveling with children as I prepare for Spain and USA next month. Great tips Jenny! You’re absolutely right that preparation is key and that you should think like a child! After all, it’s their holiday too. I love all the preparation of a holiday whether we are off camping or heading to Florida, and most of our holidays are just the 4 of us, though we have had some amazing times away with friends. We have just returned from Majorca and this is the first holiday both the children went off and made friends. It was lovely to see and it did mean hubby and I got the chance to chill in the bar whilst keeping an eye on them. Oh that does sound amazing. I can’t wait for those kind of holidays too. They make it for everyone when they can make friends. Thanks hunny. Spot on! it is always more complicated to travel with kids, but finding the right place that allows everyone in the family to enjoy the holidays is the key! This year it will be our first holiday all together since my princess was born, hopefully it will just fine! Thanks for the tips Jenny! Thanks Sandra. I am sure it will be amazing. You would be surprised how quick kids adapt and travel better than we give them credit for. To them getting on a plane must be so weird not knowing why they are being ushered into tiny seats lined up and told to sit and be quiet and all these people around them strangers. They love the intriguing aspects of it all.